Wow. Unbelieveable feelings of relief. After eight looooonnnnggg years, I finally have hope again for my country. In the last weeks before the election, I have been mostly silent, holding my breath and waiting to see if the signs of light at the end of the tunnel were real. When I think about the possible implications, I am just dumbfounded. The real chance that the wars will end. The real chance that the assault on the environment will end. The real chance that we will regain the respect and admiration of the world. The real chance that our economy can be repaired. America began as, and will always remain, a fluid and dynamic grand experiment. We are learning, as a country, across generations, how to become better as human beings. It is hard to defy all that evolutionary programming which makes us fear and distrust anyone different from ourselves, but we are slowly moving in a positive direction. Sometimes we take steps back, but they are always followed by a greater number of steps forward. 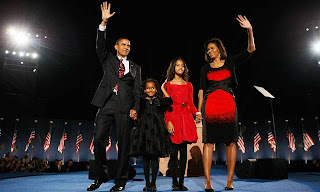 Barack Obama represents the hope that we all hold - for our nation and for our world - the world our children will inherit. Full text of his acceptance speech here. Yes We Can. Having said that, as I sit here floating in the post-victory happy place where I've been since last night, I feel obligated to link to a few words from John Scalzi offering a little reality check on things. We're not talking the second coming of Jesus here, folks. This is a man, preparing to run a country in the midst of not one but several epic crises, a man who must govern the Entire United States of America, red states included. He will be forced to concede some things. He will fail at some things. Nevertheless, I'm going to enjoy this. I want to savor the feeling of an historic moment. It's the same feeling I had in college when I watched the Berlin Wall come down. Hope, simple and pure. We may just be alright.